There’s a pretty interesting story here, but it gets delayed and mucked up way too many times by musical numbers that in no way advance the plot. This movie could have been so much better. it has a very strong story going for it, involving a love triangle and a secret that turns out to be two different love triangles and two different secrets. first, there’s the one with painter Jerry, his art buyer Milo, and the girl who he is in love with, Lise. In that triangle, Jerry is at the center. But then there’s the one where lise is at the center, caught between two men. and all of the secrets to work their way to coming out, with nice timing. The problem is, the movie is filled with long musical numbers that have nothing to do with anything. these scenes interrupt the plot and prevent us from moving through it smoothly. It’s like constantly hitting road blocks on what should have been a pleasant ride. An American in Paris starts out great. It shows the sights (the opera house, the arc D’Triumphe), has voice-over narration, and plays a couple of tricks on the audience while introducing its three main characters. With each one of them, it has the character talk in voice over, introducing himself and what he is doing in Paris. Then the camera pans to a person, who we think is this character, only it isn’t. And he will usually say something like, “No, that’s not me. I live upstairs.” at that point the camera will move to the upstairs window, where we see the person who is speaking. That kind of energy and playfulness gets the movie started just right. it takes us to Monmarte, the area of Paris where the Moulin Rouge is, and where the artists all hang out. This is an area, up on hills, where people play music in the streets, and painters stand around making portraits. Monmarte is actually my favorite area in Paris, and I love that so much of the movie takes place there, with the Sacre Coeur basilica in the background. It is on the side of one of those hills that our lead character, Jerry (Gene Kelly) is hanging up his paintings one day, when an interesting buyer comes along. Her name is Milo, a tall, aging blonde woman who wants to purchase some of jerry’s work. The scene isn’t so quick with jerry happy to sell it and willing to make it happen. Instead, he gives her a hard time, thinking she is a student who wants to critique his style and offer different ideas. He’s not interested in hearing any of that, and lets her know it. 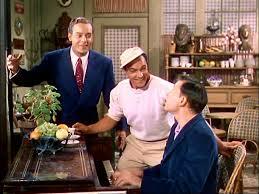 But Milo is sincere about what she wants, and asks jerry to bring the paintings over to her lavish apartment. When he does that, he gets the sense that she is playing him for more than just his art. He starts to think that she is more interested in him, and thinks she can buy herself into a relationship with him. he tells her he’s not interested, and she assures him that it’s not her intent. still we feel the strings being pulled on him, as she now takes him around introducing him to people who could impact his career. it’s at one of these parties that jerry meets a girl who he really is interested in. this girl is lise, a young beauty who jerry sneaks away from his table to talk to. when he returns to the table, he has to lie about what he was doing, but you can see that milo knows the truth and isn’t very happy. if jerry is willing to put his love of another woman ahead of his career, then her plan to use a furthering of his career in order to win him over, is doomed. jerry continues to see lise throughout the movie, but he also continues to meet people and be taken under the wing of milo. all of this would be a pretty simple and usual love triangle movie, except that there is one other major character involved. one of jerry’s neighbors. at the start of the movie, the three men we met were jerry, oscar, and georges. oscar was the man who was friends with both jerry and georges. he would sit at home, by his window, playing the piano all day. and jerry and georges didn’t know each other until one day oscar introduced them. as it turns out, georges is dating lise as well. and with georges, it is a much more serious relationship. he wants to marry lise, and is wealthy and the choice that would be better for her future. she knows that, and agrees to marry him, despite having feelings for jerry. to lise, jerry represents young love, and a fling, whereas georges represents security and a future. and the thing is, lise is the only one who knows about the two men. they don’t know about each other at all. when the secret starts to come out, to these guys, it originates with oscar, their mutual friend. jerry tells oscar all about the girl he’s in love with, including her name. then he goes off, and georges comes by and sits down. now he tells her about the woman that he’s in love with, and going to marry. when he says the name, oscar nearly chokes on what he’s drinking. from that point on, he can’t swallow a single gulp, as jerry comes back over, sits down at the table, and every time something is said that borders on the secret coming out, oscar ends up spitting up or drooling with his drink. it turns out to be a pretty funny scene, and reminds me a little of the one in roman holiday where greggory peck, his photographer friend, and audrey hepburn are all sitting at a table, and peck keeps trying to do things to the photographer to prevent him from revealing a secret. these things include spilling on him and kicking his chair out from under him. 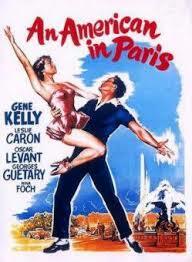 the storyline of an american in paris is great. the problem is that the story is constantly being interrupted by musical numbers. most of them have nothing to do with anything that is happening in the story. maybe they are symbolic or something, but even still, all they end up doing is delaying us from finding out more about what’s happening to the characters. the musical numbers might be lavish, colorful, big stage productions, but they still end up getting in the way and hurting the movie. by the end, we are on the cusp of finding answers to what is going on, and what is going to happen, moving forward. that’s when the movie breaks out into its longest musical number yet. it just goes on and on, and the whole time we are wanting to see the conclusion to the story about these characters. by the time that musical number ends, its as if the movie has no energy left. it gives us a quick scene that supposed resolves things, and then it ends. only the movie didn’t resolve things at all. instead, it left two of the main characters out in the cold, without ever showing us how they dealt with the problem. there are no clever solutions offered up here. instead, the movie got lazy at the worst possible time. the story behind an american in paris is great, but it would have been a lot better had it been presented without all of the musical number interruptions.